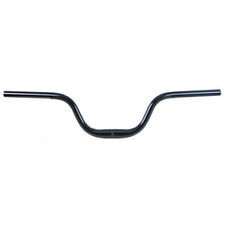 1 Handlebar. Material: 6061 Aluminum Alloy. 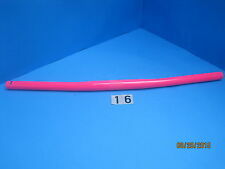 Length(center to center): 420mm / 16.54in. Color: Black. Clamp Diameter 25.4mm. New Old Stock and sold as found in a closed down bicycle shop with shelf wear which may include scratches, dings, chips in paint from years of storage as shown in the photographs. NEW take-off Cannondale C1 Carbon riser mountain bike handlebar. The handlebar is 760mm wide. We carry all of the hard to find parts and accessories, including all service parts for nearly every Cannondale platform in existence. Model: C2 Alloy. There may be marks from shifters being installed and residue from tape. Clamp: 31.8 mm. Chromag BZA 35 Carbon AM/DH Handlebar 15mm Rise 800mm Black w Gray Decals New! Chromag Fubars BZA 35 Carbon Bars 15mm Rise 800mm All Mountain / DH / Freeride. 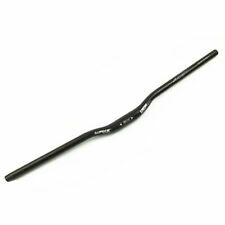 The BZA 35 Fubars are really good looking, and will improve the look and feel of any bike. Width: 800mm. Rise: 15mm (.6”). 5 out of 5 stars - Chromag BZA 35 Carbon AM/DH Handlebar 15mm Rise 800mm Black w Gray Decals New! 3 product ratings3 product ratings - Chromag BZA 35 Carbon AM/DH Handlebar 15mm Rise 800mm Black w Gray Decals New! Clamp Size: 1", Width: 25 1/4", Rise: 13", Material: Steel. Cervelo P5 - 3T Aduro High V Mount. 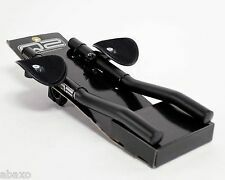 Only fits 3T Aduro Bars. 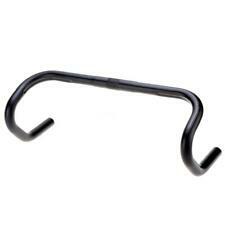 This bar shape is no longer produced by Specialized, although it's one of my favorites for a number of reasons. - Extremely versatile bar is well suited for bike parks or trail riding - Shot peened and anodized for increased fatigue life - Cost effective without sacrificing quality. Clamp Diameter 38.1mm. New Old Stock and sold as found in a closed down bicycle shop with shelf wear which may include scratches, dings, chips in paint from years of storage as shown in the photographs. NOT A FACTORY SECOND ITEM. Getting harder to find flat narrow bars like this - especially new! 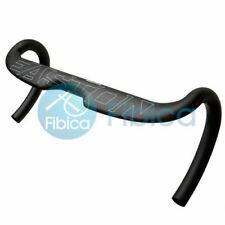 NEW Race Face NEXT CARBON FIBER RISER HANDLEBAR - MTB - 31.8mm Clamp - 720mm! A bike is a sophisticated piece of equipment with many intricate systems and moving pieces. Bike handlebars are important components in the construction of a bike, so it's a good idea to choose one or more type that you feel comfortable and relaxed using while riding. Whether you choose a riser bar, a flat bar, or a carbon fiber model designed for efficiency, you can easily customize the experience of your bike to your personal preferences. Are bike handlebars easy to replace? Most bikes require you to loosen just one bolt when changing out your handlebar. Many models of bikes that are built for speed and efficiency feature quick-release latches for unfastening the brake lines and stem. If you decide to replace the bar on your bike out on the road or trail, the entire process should take no longer than a few minutes. With compact, lightweight bike parts, you can easily carry the extra equipment without any inconvenience. What is the difference between flat bars and riser bars? These two options enable you to choose how far you lean forward when riding a mountain bike. Riser bars facilitate a more upright posture, whereas straight handlebars put users into a crouched, aerodynamic position. Your choice should depend on whether you want greater speed or agility on your cycling tour. If you plan to ride your bike on mountainous terrain, riser bars may be the way to go. If you'll mostly be travelling on smooth roads, a straight bar could be the appropriate choice. What is the advantage of using Aerobar handlebars? These handlebars for road bikes from Profile Design are specially constructed to provide comfort for extended tours cross-country or around the city. They feature contoured bar ends and grips that make it easy to balance your weight in the saddle without putting excess pressure on your wrists and elbows. Profile Design makes a wide range of Aerobar models that are suitable for any riding style. Whether you prefer to lean forward with your elbows supported by pads or you'd rather hold the grips of a drop handlebar, you have more than enough choices. How do you care for cycling handlebar parts? It's important to regularly clean and oil the handlebar parts on your bike to maintain optimal condition. You may want to disassemble the parts after riding through rain or mud so that you can thoroughly clean them and allow them to dry. It's also a good idea to keep extra equipment on hand in case you need to use your bike while your grips, bar ends, or riser handlebars are drying.